There isn’t a day that goes by when I’m not grateful that I am part of the generation that created athleisure. Millennials went and made outrageously casual outfits trendy. I mean, if you just look at all of the NYFW street style pics, you’ll see athleisure pieces incorporated into high fashion outfits left and right. Consider it the patron saint of my generation. I’m not complaining – athleisure is probably my most-worn category of clothing – my spirit outfit, if you will. Now that it’s September, I’m convinced that my favorite athleisure pieces are going to be the easiest to transition into fall (there really is no other option, to be honest). My outfit in this post was so comfortable that I ended up wearing it straight to work after my shoot; I just swapped my leather jacket for a jean jacket for a bit more booty coverage for the office. With the help from my co-workers’ style and some inspiration from Pinterest, I’m sharing some of my style tips that I’ve found to transition your favorite athleisure pieces into the fall for the office, running around, and even girls’ night out! Opt for tailored pieces: Because athleisure pieces tend to come in more relaxed fits, add some structure to your outfit with a blazer (30% off until midnight tonight! ), military jacket, or a collared button down shirt for the office. This way you can still ball out in the comfort of a pair of joggers and look professional for your daily meetings because #bossbabe. Bring out your street sneaks: This may be geeky but I honestly prefer to run errands in my running tennis shoes. I just feel so much more stable and like I can get things done faster. Anyone else? 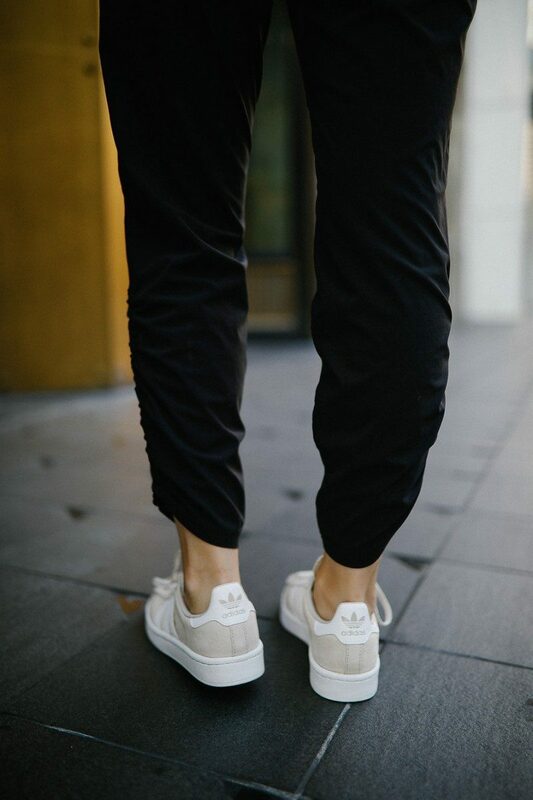 But if I want to look more put together for a day out and about or if I’m meeting up with friends, I always grab my Adidas Campus sneakers because they’re a chic neutral and also really comfortable. Keep your look sporty yet cozy with a statement sweatshirt or oversized hooded cardigan topped off with your go-to ball cap (the predecessor of dry shampoo). Get trendy with it: So you’ve decided to hit the town (after bailing on 98% of your previous plans? Same. ), but you want to channel your ultimate sporty spice chic. Yes [clap!] girl [clap!]. Would the real fall trends please stand up?! Obviously, step one is throwing on a pair of pointy toe heels (this pair is actually comfortable, no like really). Then pick your poison: a lace cami and bomber jacket combo or a mock neck tank and some oversized denim jacket vibes. This may be pushing it, but I’d bet you’d look killer by throwing in this trending hat style, too. Where will you wear your fall-ready athleisure outfit first? !